If last year's 'Shoe That Women Can't Get Enough of But Men Loathe' was the Acne Atacoma, then this year's 'it' shoe is bound to be the clog. I should be smart enough to resist. After all, I pride myself on not jumping in too quickly on the trend bandwagon (yes, some may disagree but I have yet to wear tights and denim shorts...). I want to build a wardrobe that can grow with me from year to year and not one that can be picked apart by the season an item was bought in. I'm already seeing clogs all over the blogs (a rhyme, yes). Isn't it funny how one can sick of seeing a certain item without even having seen it worn in real life? Anyways, despite the fact that I'm sure clogs will be overplayed, I caved and bought a pair because the dutch farm girl in me couldn't resist (I made up the part about the farm girl...). The summery quality of clogs is infectious. 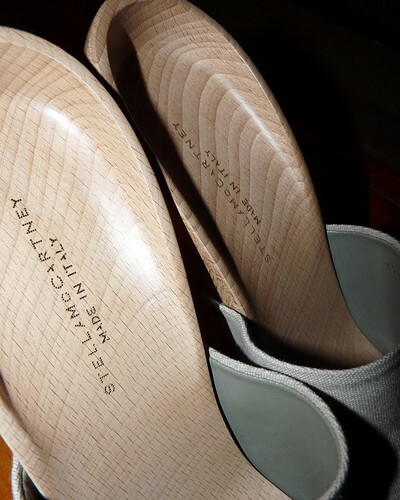 I found these Stella McCartney's(!) at Holt's Last Call on the final day of the 70% off the last ticketed price sale. Um...score! It was so sweaty and hectic in there, which is never a pleasant shopping experience, but whatever, I walked away with these babies for less than you will find the Aldo knock-offs this spring. The heels looks deceptively high but there is actually a lower ledge for your foot, so the rise isn't that intense. They are a bit trickier to walk in than other shoes, so the my scary heels rule applies... no more than 2 drinks when I'm wearing these. Is it spring yet? Is it spring yet? How long do I need to wait before I can wear my clogs and force my friends (my real life friends, not the bloggy ones...just clarifying) to compliment me for some footwear that they don't see the appeal of? Oh boy, I love my clogs! P.S. Thanks to An Affair With Fashion (clever name, though I feel like I'm having more of an affair with blogging than fashion...'I promise Matt, I did not just spend 5 hours online, I was cleaning the keyboard!') who just did a feature on my favourite shoe purchase of 2009... my Derek Lam's, which, incidentally, were also bought at a Holt's Last Call super sale. I really am a retailer's worst nightmare... I won't buy anything until it's 90% off. OMG, these are so amazing. I will always love the clog. Always have. I'm not ashamed. These are too right, my friend, too right. I can't wait to see you style them! YES I love me some clogs. I can't believe you got them for so cheap! I love them! They will definitely transcend the seasons! I'm glad that I kept my clogs from three years ago (the last time they were hot) since I'll clearly need them this spring. Those clogs are hot, but I am completely scared for you. I actually find clogs annoying to walk in and can't quite figure out why they keep coming back. Cute....impractical....designer...and very painful looking. All equal out to the formula of the perfect Jentine shoe. Those are sweet - not a clogs fan here but I would go for those. And I'm the same way with retail - only shop the clearance (well - except for pants because it's so rare that they fit). Fantastic shoes!! I still haven't decided if I'm going to get a pair of clogs yet. I guess it depends on if I find the right pair at the right price. Whew, those are gorgeous and quite a find! I bet you're right, though ... I've already seen Husband Mike turn up his nose at the clog trend. Jealous! I need to go to this sale with you someday! Surely being Dutch means a free pass to wear clogs whenever you damn well please . . .
they are sooo in right now!!! Can't wait to see how u style them up! You're in Hamilton, no way? So close! Which Holt's Last Call are you going to? I never find crazy deals like that (I go to the one at Vaughn Mills). this makes me SO happy!!! i have a pair of michael kors clogs that i've been hanging on to for a few years. they are beautiful (in my mind) but my old fashion marketing major roommate absolutely loathed them. do i get "told ya so" rights now??? ;) love your blog! hahah--i LOVE the clogs. i totally have two pairs (given, they are danksos and birkenstocks read: not fashiony at all). these are RAD. I just bought a pair of high-heel clogs at a consignment store this morning. Funny. Those are gorgeous clogs! I think I like those even better than the ones on the runway right now. I've had the same obsessed lately and I am SO envious of the ones you found! The color is perfect, too! I'm not a huge fan of clogs but these are really great! I love the unique shape! I am glad you gave in! Those are suuuuper cute...and Stellas?! Awesomeness! I have my pair of clogs and wear them alllll of the time! I just bought some that are borderline clogs...I am hoping that even after the clog trend passes I will still wear them!